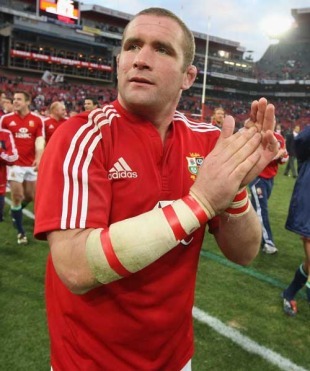 England prop Phil Vickery has backed his side to make an immediate impression in this year's Six Nations. The veteran tight-head, who is currently battling back from a neck injury, was one of host of frontline players sidelined for England's disappointing autumn campaign that saw them beaten by Australia and New Zealand either side of a far from impressive victory over Argentina. But the 33-year-old is confident the team will bounce back to form in their Championship opener against Wales on Saturday - bolstered by the return of the likes of fullback Delon Armitage, centre Riki Flutey and No.8 Nick Easter. "I am optimistic. There have been a lot of negative things written about the England team but I am excited, I think it has got the potential to be really good," said Vickery, whose last international appearance was for the British & Irish Lions last summer. "England will come up against the best Welsh team there has been for a long time. They can't be negative. "Whatever has happened in the past, just bin it. If you are going to play a gameplan that is reasonably safe you will not stretch yourselves too much and you will not stretch the opposition. Then you get into a damage limitation exercise. Riki and Delon are guys with a bit more spark about them, guys who can talk. England this week should go out, make a real statement and lay their stall out. I am really hopeful." Vickery has also pinpointed the battle up front as key to both sides' fortunes and rates the Welsh front row as the best in the world after they demolished South Africa in the Lions' third Test clash last summer. In contrast, Johnson only has two capped props in his squad, in Wasps loose-head Tim Payne with 15 and Bath tight-head David Wilson with four. One of uncapped pair Matt Mullan or Dan Cole will be included in the squad. "Gethin, Adam and Reesy are the best front row in the competition, if not the best front row in world rugby," said Vickery. "You can go two ways when you face a front row like Wales' - and the England boys are more than capable of taking them on. I don't see why they should fear it. They go out there and get stuck in."